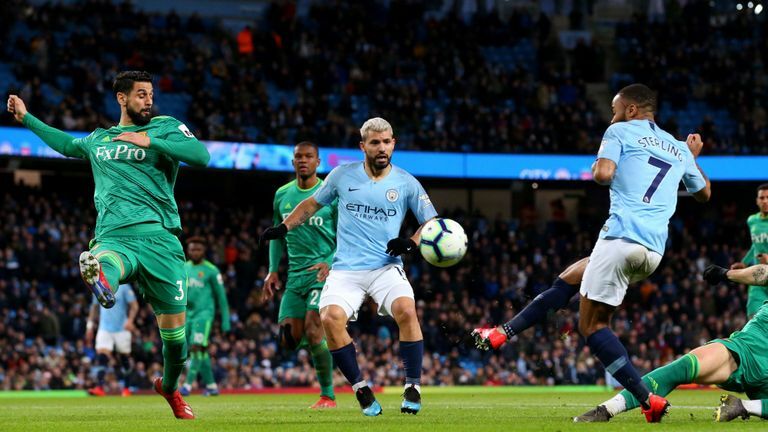 Raheem Sterling scored a 13-minute hat trick as defending champion Manchester City beat Watford 3-1 to open up a four-point lead in the English Premier League on Saturday. The England forward's first goal was controversial but his quickfire treble turned a frustrating game decisively in City's favor early in the second half. Gerard Deulofeu did pull one back for the visitors at Etihad Stadium but City held on to up the pressure on closest challenger Liverpool ahead of its game against Burnley on Sunday. It took time for City to find a way through, as it was involved in a goalless first half for the third league game in a row. And when Sterling's opener finally came just after the break, it took time for the referees to confirm it should stand. Sterling was well offside as he ran on to a ball from Sergio Aguero, but an attempted intervention from Daryl Janmaat proved critical, with the defender's attempted clearance rebounding off Sterling before looping into the net. Watford's players reacted angrily when the officials eventually decided the goal should stand and their minds may have been elsewhere when Sterling doubled his tally moments later. This time there was no debate as the England forward simply tapped in from a low cross by Riyad Mahrez. Sterling completed his treble just before the hour as he jinked through the area after collecting David Silva's through ball and blasted past Ben Foster. Sterling was replaced by Leroy Sane soon after, but Watford also made changes with the twin introductions of Troy Deeney and Deulofeu, who scored just 17 seconds later with his first touch.